I love these flower borders for coloring, but thought I'd try something different with my card today. I chose soft pink card stock, and stamped one side of the floral border in Ranger Archival watering can ink about 2/3 of the way down the card front. I used my Misti to get a good image and precise placement. 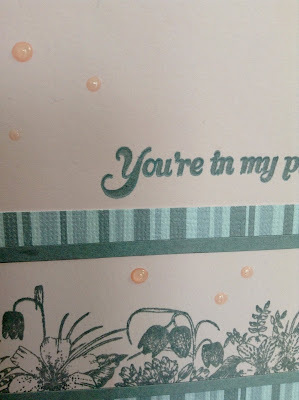 I used some patterned paper from my stash to create some borders on my card front. I also added some strips of gray card stock to give it more interest. 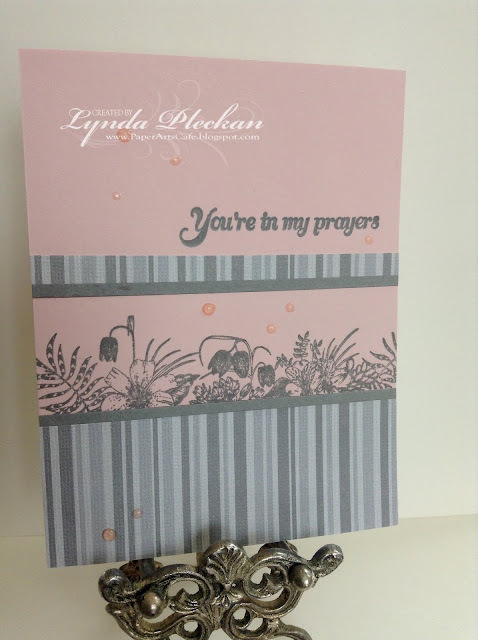 I stamped the In My Prayers verse along the top in the same watering can ink, again using my Misti to stamp it a couple of times to get the density I wanted. I added a few Nuvo Jewel drops for some accents. For the inside of my card, I stamped the other border image, and added strips of the same pp and card stock. I like bringing the theme to the inside of my card. I feel it gives it a more finished look. I hope you have had a chance to see the February new stamps release, and were able to hop along with the design team for some inspiration. If not, you can check out their projects HERE. If you are going shopping in the Technique Junkies store, you can get 10% off with my code, TJ10Lynda. Are you inspired by this amazing Floral Framed Sentiments set? The flowers are lovely colored, as well as just stamped in a single color as I've done here. And the phrases in the set are beautifully written.